Well, it doesn't seem to truly exist here, at least if it's not previously frozen. Since that's the closest we've come to it thus far, it does well enough for DucCat and I. Last night was a dim sum night. We typically have some sort of vegetable with dim sum, and tonight DucCat had found kim chee at Harris Teeter. 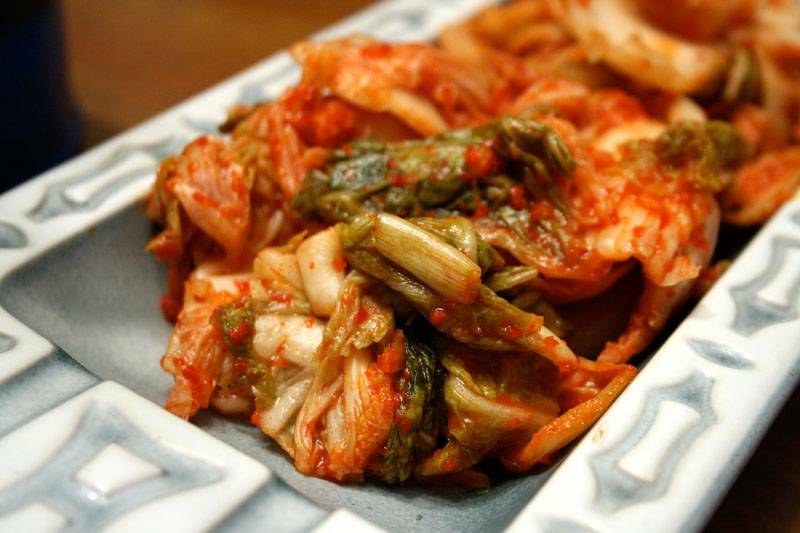 For a jarred kim chee, this was pretty good stuff. Flavourful and spicy. 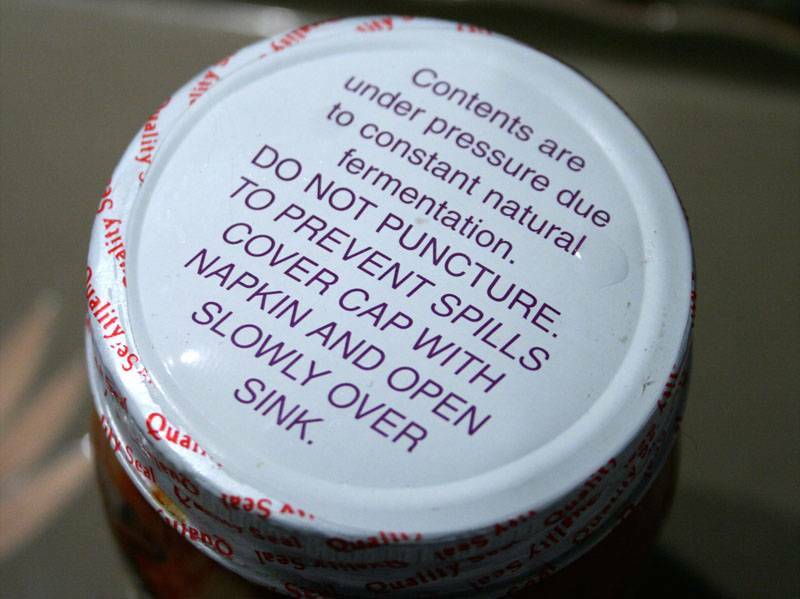 Of course, the warning label always gets me going. Each time, I hold it gingerly over the sink, cupping the top with a napkin- and nothing more scary than a soft pop happens. I've seen far more ferocious champagnes. 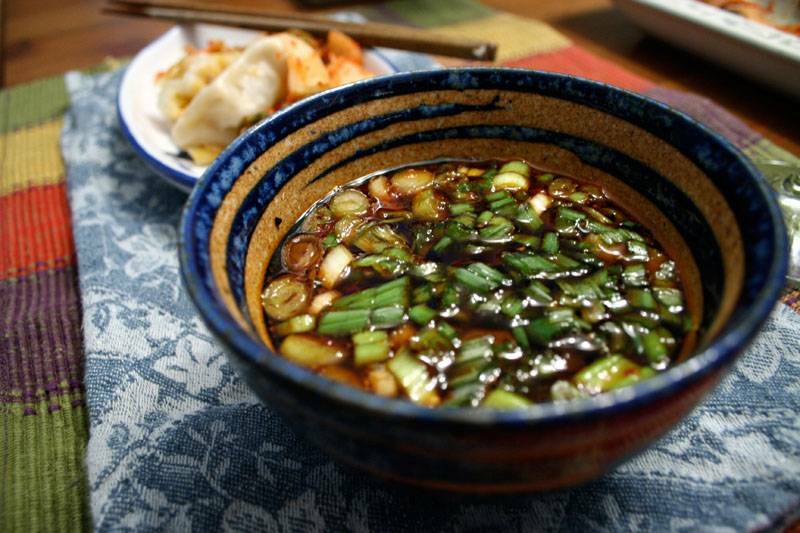 As the freezer dim sum steams away, I make the dipping sauce, something I picked up from Recipezaar's taylortwo: "My Korean Dipping Sauce". I always add the optional garlic-chile paste. We had to try a new brand (rooster), which turned out to be surprisingly wimpy. I had to triple the amount we normally use to get any semblance of heat or garlic. 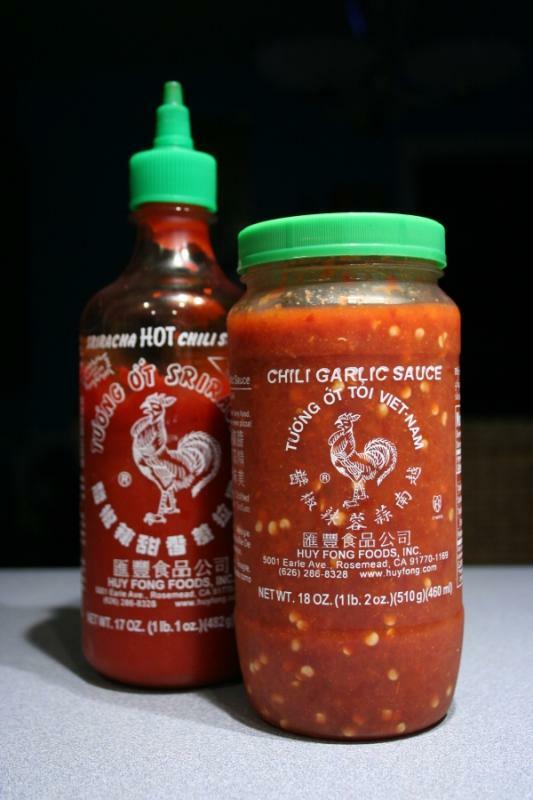 Luckily, there was enough sriracha around to heat things up once again. Now for a question I'm really not sure I want to know the answer to. 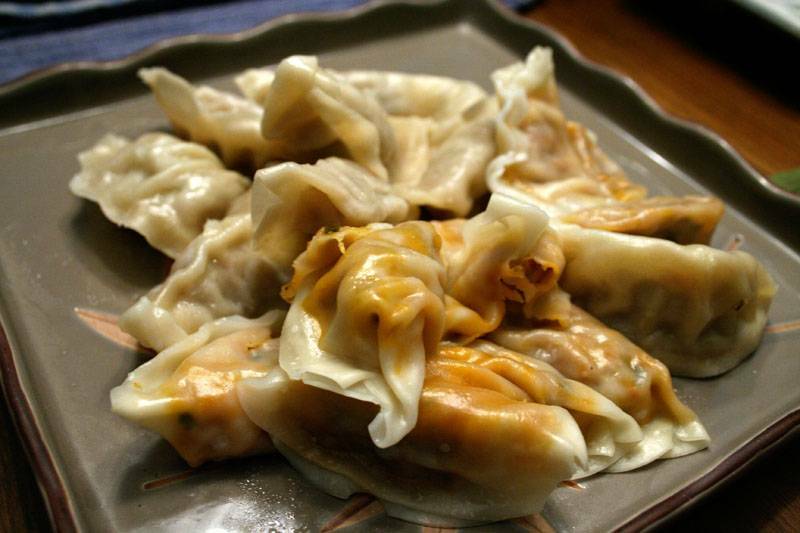 What the hell kind of dumpling is this supposed to be, anyway? There's nothing else in English on the package that indicates what the contents are, except the picture of the jolly old fat man. I mean, maybe it's supposed to be reindeer. It couldn't really be Santa Claus-flavoured, now could it?!? 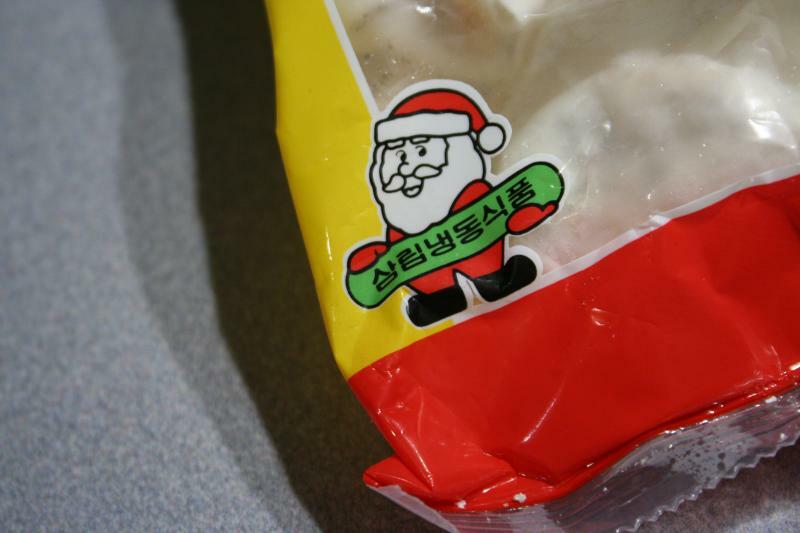 I couldn't detect anything from the North Pole in these dumplings, and even suspect that they may contain kimchee. At least, I hope that's why they were so red. For jarred kimchee, this wasn't too bad. 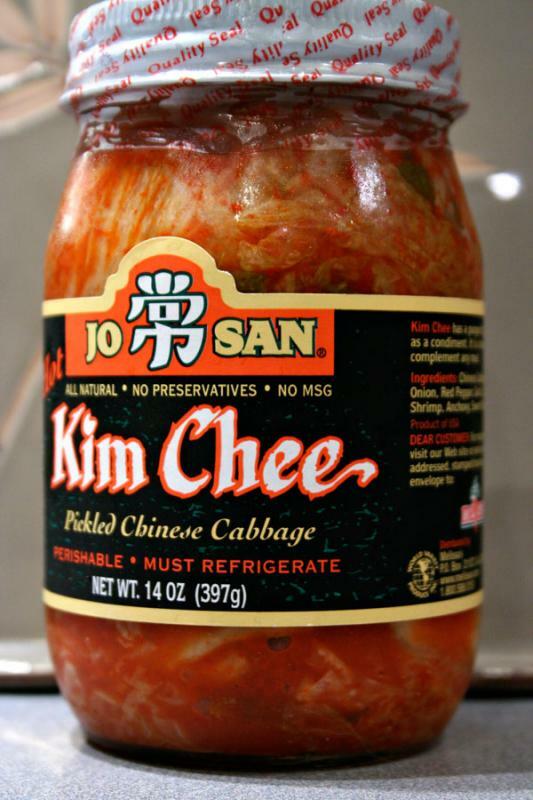 For jarred kimchee from Harris Teeter, it was surprisingly good. The dipping sauce, as always, was just right, thanks to the judicious amount of Rooster sauce. This is one of our favourite quick weeknight meals! Mix together first seven ingredients, then divide into two bowls. Split chopped green onions between the two bowls. Let sit for at least an hour for flavours to develop; the longer, the better, of course. PS- Where the hell can we go to around here to find good dim sum?! We're willing to travel, yo. S'kat if you check out my blog I made Dim Sum or Shao Mai myself. They are really very easy to make and you know what's in them. You can make a whole bunch and then freeze them. How was the Outter Banks? I hope their weather was a lovely as ours this weekend. Couldn't have asked for better weather this past weekend. Hope you had a great time! As far as I can tell, there isn't any good dim sum around here. Mainly because not many places offer it and those that do are so-so at best. I've been spoiled forever by having out of this world dim sum at Yank Sing whenever I visit my family in San Francisco. Went to Jade Villa (on Independence in VB) a while ago and was soooo underwhelmed (as in, it kind of made me gag). I hear that Forbidden City - reopened in a new location on Shore Drive - is serving dim sum, but I haven't had a chance to get over there. If you DO find good dim sum in the area, I beg you, let us know. vlb, I took a look, and it sounds quite easy! I'll definately give this a whirl. And the weather down in Duck last week was just perfect. Erin, I must say that I'm envious of your San Fran-dim sum connection! I doubt that I'll make it over to the Beach for untested dim sum, but if something else pops in under my radar, I'll definately speak about it here. The Cats are Out of the House!